On December 30th, 1950, Billy Cook began a crime spree in the American southwest that left several motorists dead. It ended in Santa Rosalia, Mexico where he had forced hunters James Burke and Forrest Damron to drive him. Local authorities recognized the criminal and apprehended him, sending back north of the border to face trial and swift execution. Within a year of his death, the last leg of Cook’s run became the basis for a chilling thriller. 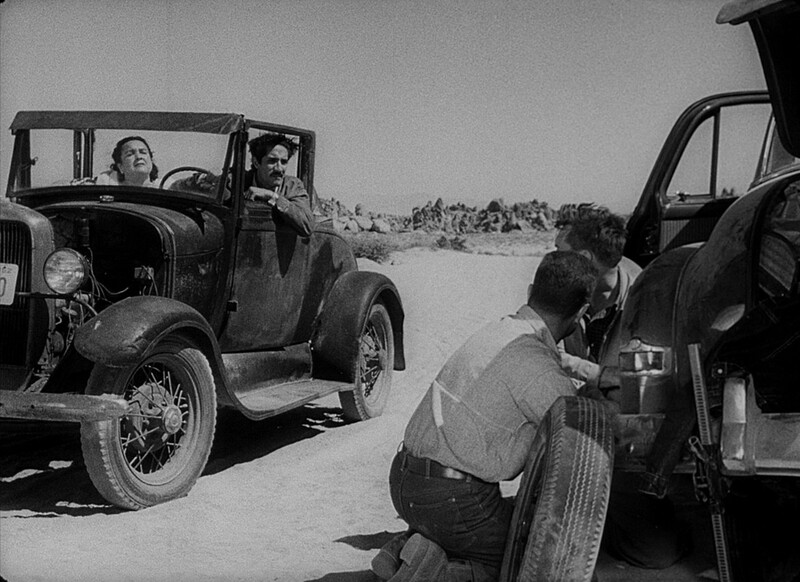 The Hitch-Hiker is credited as the first noir film to be directed by a woman. Ida Lupino helmed the project, and under her direction it became more than just a crime story. The Cook stand-in Emmet Meyers (William Tallman) is a desperate criminal, doomed by his inhumanity, but he’s something else, rarely seen even in the genre of depraved indifference. Like a lot bad guys, he’s rotten to the core, practically a stereotype of callous and selfish evil. But he stands out for the ways in which he expresses his contempt for life. Roy and Gil change a flat tire while Emmet trains a gun on them through the open door. The kidnapped duo in the movie are fishermen Roy Collins (Edmond O’Brien) and Gilbert Bowen (Frank Lovejoy). In one of the film’s most harrowing scenes, Emmet forces Gil to shoot a can out of Roy’s hand. You know because of the era that Roy is going to be fine, but there’s a small doubt that this film might not play by the rules. After all, it opened with three murders in quick succession. There’s real tension when the group is resupplying in a small grocery that Emmet might start shooting. 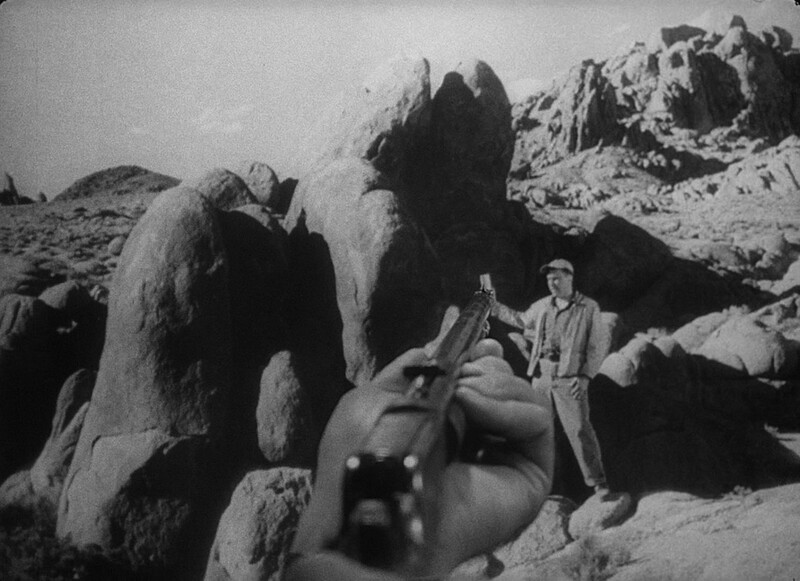 The audience sees Roy from Gil’s viewpoint in this harrowing scene. One trait of the real killer that carries over to the film is a deformed eye. The lid never fully closes, and Emmet uses that as an instrument of terror. When they lie down to sleep, they can’t tell if he’s actually unconscious or slyly watching them. It’s an effective othering that places him at an advantage over his captives. It’s difficult to know whether Emmet is actually asleep. Like many movie villains, Emmet lacks empathy and sees compassion as a weakness. The difference is that he demonstrates time and again that he truly does not understand. Even as he exploits the men’s loyalty to each other, he shakes his head at what he calls their stupidity. It’s not the usual lofty arrogance of a bad guy who has rejected society; Emmet is confused, because he’s never belonged anywhere. His background is a litany of rejection and alienation, which left him poorly equipped to deal with human bonds and teamwork. Emmet enjoys lunch while keeping his captives under guard. 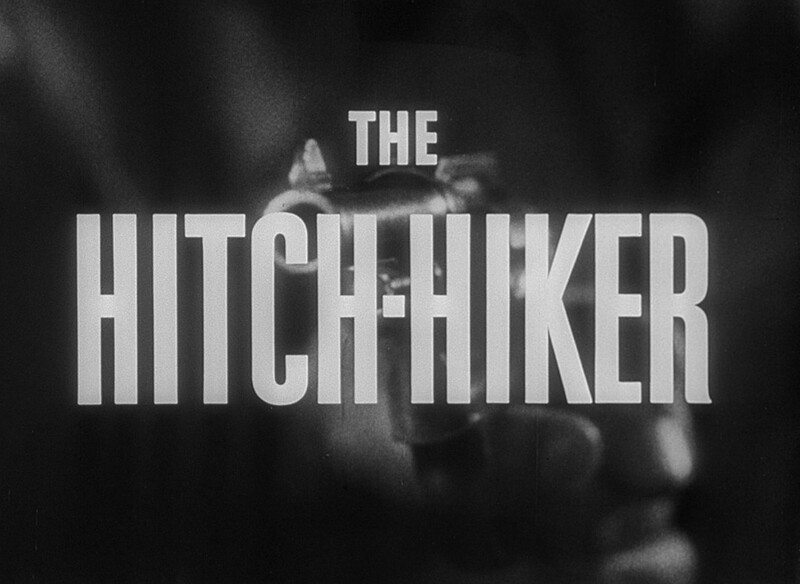 The Hitch-Hiker is a boundary-pushing thriller that keeps you afraid for the protagonists and incidental characters. I may be making spurious connections here, but it seems to me that this crime film lays groundwork for 70s survival horror like The Candy Snatchers , The Last House on the Left , and Rabid Dogs . 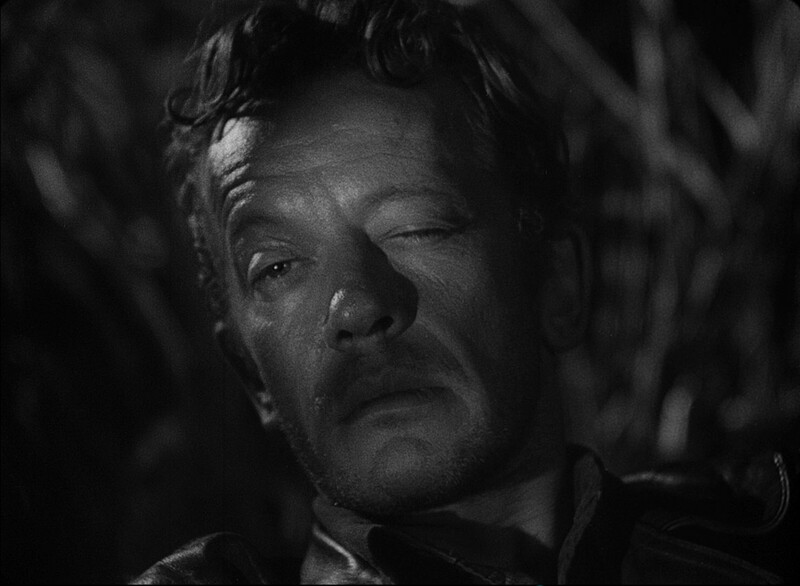 The brutality in those films realizes the threat that permeates The Hitch-Hiker , that crime will unleash a ravening violence. 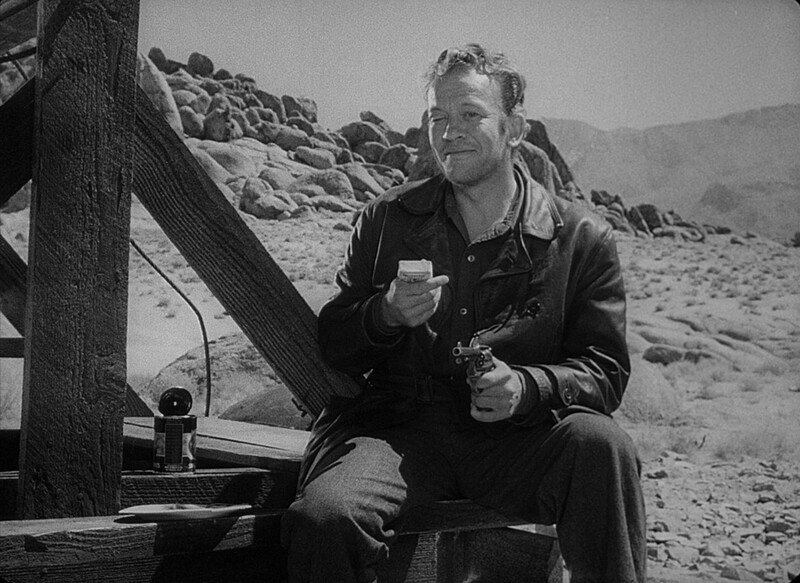 Perhaps the expectations that come from familiarity with later movies help us to see Emmett as the menace he would have seemed to audiences in 1953. They had the fear of possible actions, while we bear the certainty of disaster. Either way, it’s a white-knuckle ride. HubrisWeen is a yearly event, in which several bloggers review horror and monster movies in alphabetical order leading up to Halloween.